Wallace “Wally” Amos, Jr. was born on the 1st July 1936, in Tallahassee, Florida USA, and is an entrepreneur, who is probably best recognized for being the founder of of the Famous Amos chocolate chip cookie brand, and Uncle Wally’s muffins. He is also known as a television personality who hosts “Learn To Read”, an adult reading program. Beside that, he is known as an author, too. So, have you ever wondered how rich Wally Amos is? It is estimated that Wally counts his net worth at the amount of $20 million, as of mid- 2016, which has been accumulated not only through his successful career in the business industry, but also through his career as an author. 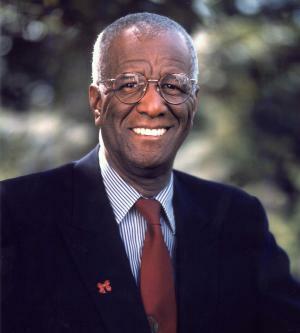 Wally Amos spent one part of his childhood with his parents in Tallahassee, Florida, until they divorced, after which he moved with his aunt to Manhattan, New York. As he showed interest in cooking from an early age, he enrolled at the Food Trades Vocational High School. He was cooking with his aunt, Della Bryant, and he developed his own recipe for chocolate chip cookies. Prior to actually matriculating, he began to serve in the US Air Force, so he earned his high school equivalency diploma during his serving. When he was honorably discharged from the military, he came back to New York and continued studies at college. Upon graduation, he began to work for the William Morris Agency, a Hollywood-based talent agency, in which role he discovered Diana Ross & the Supremes, and Simon & Garfunkel. With this job, his net worth was well established. He stayed with the William Morris Agency until 1967, when he left and moved to Los Angeles, California, where he established his own personel management company. Beside that, he wanted to open a store to sell his chocolate chip cookies, but he didn’t have enough finance for that, so the first Famous Amos cookie store wasn’t opened until 1975, on Sunset Boulevard, Los Angeles. This business was very successful, and so expanded very quickly, such that after a few months he opened two more stores on West Coast, and in New York City, increasing his net worth by a large margin. Additional to this, he appeared in the episode “Latka’s Cookies” in 1981. However, insecure business management in 1985 cost him a lot, as he was forced to sell to the Shansby Group. Furthermore, Wally tried in 1991 to establish another cookie company, under the name Wally Amos Presents Chip & Cookie, but the Shansby Group sued him for violating an agreement that he couldn’t use his name on the packaging of any food products. However, in 1998, another company bought the Famous Amos brand, and he became its spokesperson. Later, in the mid- 1990s, Wally worked with Lou Avignone, and they launched another company named Uncle Wally’s Family of Muffins, which added a lot to his net worth. Furthermore, he founded the new cookie company – Chip & Cookie. His net worth was restored. Apart from his career as an entrepreneur, Wally is also recognized for working as a television host of the adult reading TV series “Learn To Read”, as he was a member of the project Literacy Volunteers of America. Wally is also known as the author of nine books, such as “The Power In You”, and “The Cookie Never Crumbles”, which also increased further his wealth. Regarding his personal life, Wally Amos has married three times, now to Christine Harris, and he has four children. His current residence is in Kailua, Hawaii. 1 Nothing is an obstacle unless you say it is. 2 I lost a company. So what? It's just stuff. Can't take it with you.